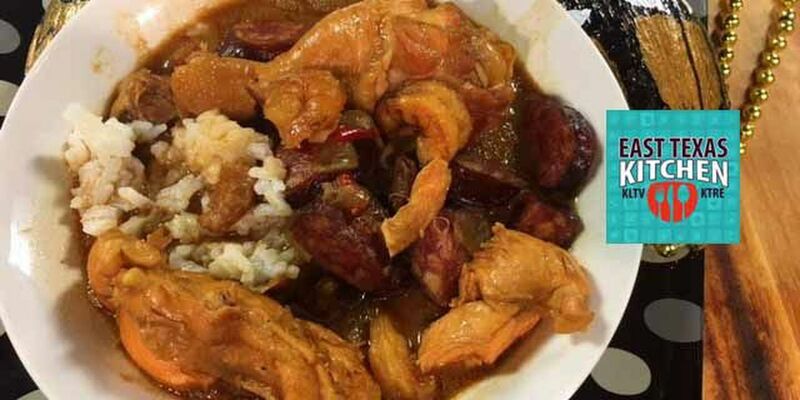 (KLTV/KTRE) - Keith Honore, senior director for KLTV, shared his mom Yvonne's recipe for authentic Louisiana gumbo. The Honores are from Lake Charles, and clearly, they know their gumbo. Here's the guidelines (since there is no exact gumbo recipe; everyone has their own preferred method) for Keith's mom's gumbo. Take a large boiling pot, large enough for your ingredients and the roux, as you don't want to overflow! Fill the pot with water. You'll want a little more than 1/3 of the pot full of water. If you have a large stirring spoon, fill the water about inch above the neck of the spoon. Get the water to a rolling boil then add the Holy Trinity for about 10 minutes. Next Roux it up! Since we're using dark roux out of the jar, spoon a little more than half of what you have, save some for later in case you need to thicken your gumbo. Then stir like a boss, really get in there and break the roux making sure none is tuck at the bottom. Your heat should be medium-high, still a slight rolling boil. Depending on your stirring skills it may take up to 20 mins to get totally boiled down you can add some Cajun seasoning while this happening as well, but after that drop your smoked meats! The secret to a good tasting gumbo is a gooood smoked meat. The darker the smoked meat the better!! Boil your smoked meat down for another 20-30 minutes til you see your sausage float a little. Next add the dry shrimp and chicken. Chicken doesn't take that long to cook, so monitor carefully maybe 15-20 in a slight boil depending how much you add. A good judgement, if you see the meat falling off your chicken bone, move to the next step lol. Seafood!!! Again doesn't take long to cook because of the heat. If you have crab legs let those go first so they'll soften. After about 15 more minutes add your shrimp and continue to stir til shrimp is full cooked. The waiting game: let your pot and ingredients sit before serving, drop the heat to about medium or medium – low, the longer you sit the better! Serve that bad boy over some rice and you’re good to geaux!